FRANKFORT, Ky. (Monday, February 19, 2018) – The Kentucky Equine Education Project staged its second KEEP Day in Frankfort, with horsemen and horse enthusiasts of all breeds and disciplines interacting with state legislators to discuss the economic importance of equines in their home districts. A prevalent message: Kentucky didn’t become the Horse Capital of the World by being a one-trick pony. Horses of all types contribute significant assets to local economies and have a valuable impact on the quality of life all across the Commonwealth. Rep. James Kay with Sharon Ohler of the Kentucky Paint Horse Club and Jerelyn Duncan of the Kentucky Arabian and Half Arabian Breeders Alliance. Rep. John Sims, Rep. Sannie Overly and KEEP executive vice president Elisabeth Jensen. Horses of all breeds form a $4 billion industry in the Commonwealth, supporting an estimated 100,000 in direct and indirect jobs and spanning all 120 counties. Kentucky is home to 35,000 operations with at least one horse, totaling 242,400 equines and $23.4 billion when including related assets, according to a University of Kentucky Department of Agriculture survey. 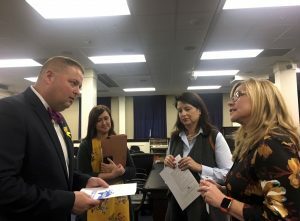 Elisabeth Jensen, KEEP’s executive vice president, called KEEP Day “a great opportunity for us to connect the dots” for legislators, with 20 Kentucky representatives and senators coming by the casual two-hour event. 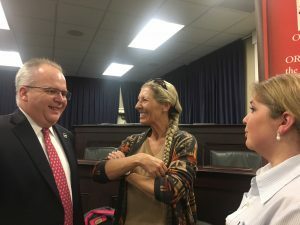 “I was very pleased that so many individuals from throughout the horse industry in Kentucky – the Quarter Horse industry, Arabian, Paint Horse, the Hackney ponies, different breeds and associations – had an opportunity to interact with legislators who might not have realized that they had horses and horse businesses in their district,” she said. Jensen said important connections come out of KEEP Day. She cited Horse Country executive director Anne Hardy meeting with Regina Stivers, the deputy secretary of the Tourism, Arts and Heritage Cabinet. Horse Country is an initiative that makes tours at breeding farms and prominent equine facilities readily accessible to the public. “They talked a lot about the tourism opportunities for the horse industry,” Jensen said. Those participating in other breeds also expressed appreciation for how Thoroughbred racing helps the larger horse industry. That includes the Kentucky Horse Breeders’ Incentive Fund that provides award money for 11 non-racing breeds, made all the more important with some breeds’ decreasing numbers. The KHBIF is funded by a percentage of the sales tax on the stud fee when a mare is bred to a Kentucky stallion, with Thoroughbreds overwhelmingly financing the program. The incentive awards for horses residing in Kentucky are earned through shows and contests in the state. Rep. James Kay of Versailles said it was important for his colleagues to understand the extent of the equine industry and that it involves much more than racing. “When you expose the entire world of the horse industry, all the different breeds and many different jobs it creates, it gives the people a new reason to be supportive,” he said. Rep. Phil Pratt, National HBPA general counsel Pete Ecabert, Kentucky HBPA executive director Marty Maline. 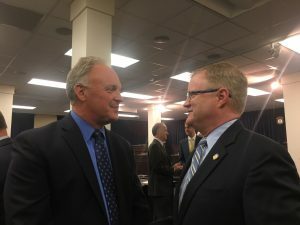 Rep. Phillip Pratt, whose district includes parts of Fayette, Owen and Scott counties, noted the horse industry’s broad reach, using the example of businesses not directly involved in horse racing that depend on work and services provided to Keeneland. 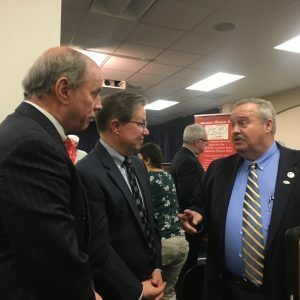 Norm Luba of the Kentucky Quarter Horse Association said he appreciated the opportunity to meet with lawmakers, including those who might not have realized the massive number of horses in the state. There are about 45,000 Quarter Horses in Kentucky, according to the UK survey. Eric Hamelback, chief executive officer of the National Horsemen’s Benevolent & Protective Association that represents Thoroughbred owners and trainers across the country and Canada, said Kentucky is the beacon for other states when it comes to the horse industry. Rep. Adam Koenig, Mountain Pleasure Horse Association president Robin Little (middle) and MPHA vice president Becky Layne. The Kentucky Equine Education Project is a not-for-profit grassroots organization created in 2004 to preserve, promote and protect Kentucky’s signature multi-breed horse industry. KEEP is committed to ensuring Kentucky remains the horse capital of the world, including educating Kentuckians and elected officials of the importance of the horse industry to the state. KEEP works to strengthen the horse economy in Kentucky through our statewide network of citizen advocates and our foundation, which has awarded more than $700,000 to local equine organizations. To learn more about how you can become a member or make a contribution, please visit www.horseswork.com. 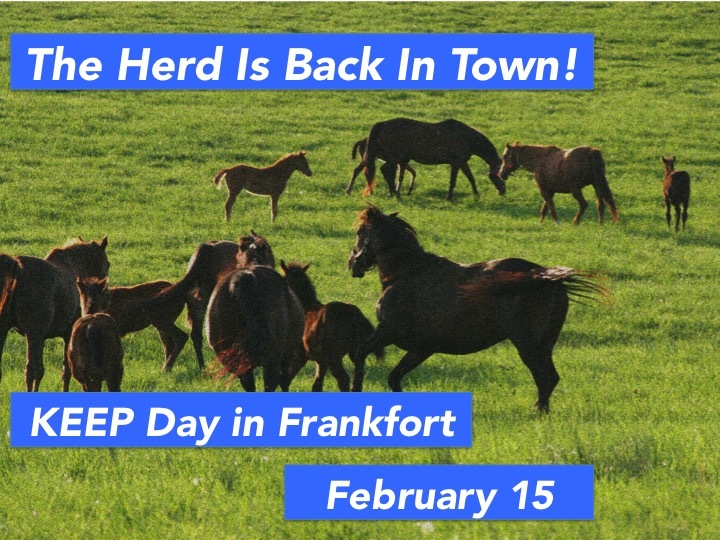 LEXINGTON, Ky. (Wednesday, February 7, 2018) – The Kentucky Equine Education Project is staging its second KEEP Day in Frankfort on Thursday, February 15, 2018, providing a convenient setting for those involved in the industry to share with state legislators the importance of horses to their districts’ economy. The event will run from 12:00 PM – 2:00 PM in Room 129 in the Capitol Annex. The informal setup will allow industry stake-holders, including horse enthusiasts and racing fans, to interact with a variety of state senators and representatives. Created in 2004 to preserve, promote and protect the state’s signature industry, KEEP represents and advocates on behalf of Kentucky’s entire horse industry – all breeds and equine pursuits. Rep. James Kay of Versailles said at last year’s inaugural KEEP Day that horses are an important economic tool even in areas of Kentucky that aren’t home to high-profile breeding farms or racetracks. LEXINGTON, Ky. (Thursday, February 1, 2018) – Citing the signature horse industry’s increasing difficulty in finding enough workers, the Kentucky Equine Education Project (KEEP) is asking Kentucky’s Congressional delegation for support in getting cap relief for H-2B visas as well as rejecting any measure that would decrease those non-immigrant visas. KEEP represents all horse breeds and disciplines throughout Kentucky. 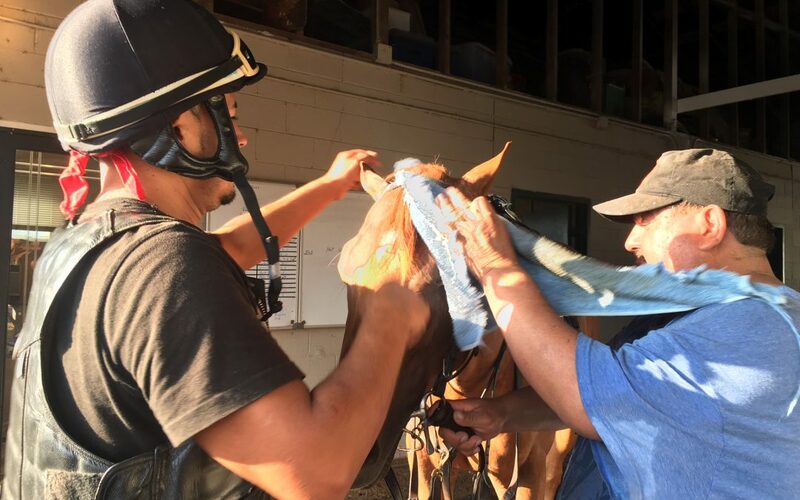 Whether it’s a racing stable, show barn, riding program, boarding facility, sales consignor or horse farm, the inability to get enough help threatens those businesses’ economic health and hamstrings the ability to grow. The National Horsemen’s Benevolent & Protective Association, which represents almost 30,000 Thoroughbred owners and trainers throughout the United States and in Canada, stands with KEEP in its letter to Kentucky’s U.S. senators and representatives, said Eric Hamelback, the National HBPA’s chief executive officer. The H-2B visa program is critical for seasonal and small businesses lacking sufficient domestic workers to adequately staff the unskilled and entry-level positions vital to their success. The H-2B visa program allows those businesses to supplement their American workforce with well-vetted returning workers who come to the United States for up to 10 months of seasonal employment before returning home. The H-2B program currently has a Congressionally-mandated cap of 66,000 visas for the entire country. The horse world competes with seafood processing, roofing and construction, landscaping and golf courses, carnivals and state fairs, food concessions and fast food, forestry, stone quarries and a myriad of other industries for those visas. Exacerbating the situation is Congress’ failure to fund continuation of the exemption allowing those granted H-2B visas to return to America for more seasonal work without counting toward the 66,000 cap. The first half-year cap of 33,000 visas for Fiscal Year 2018 was reached on Dec. 15. The second half of the cap begins April 1, with the United States Department of Labor already receiving 92,576 requests as of a week ago. Research shows that every H-2B visa creates and sustains 4.64 American jobs. “It is difficult to see how Kentucky’s horse industry escapes harm without the cap being lifted,” Elisabeth Jensen, KEEP’s executive vice president, wrote on behalf of her board in the letter to Kentucky’s Washington contingent. Jensen said KEEP is pushing for long-term labor solutions through recruiting and retaining a home-grown workforce. Remi Bellocq, executive director of equine programming at the Bluegrass Community and Technical College’s North American Racing Academy, will chair a new KEEP workforce development task force, she said. KEEP asks industry participants and horse enthusiasts to contact Washington, including through social media, about the H-2B program’s critical role. Kentucky residents can go to horseswork.com/advocacy to send a message (prepared or personalized) to their U.S. Representative as well as Senators Mitch McConnell and Rand Paul. The H-2B Workforce Coalition recommends using the Twitter hashtag #saveH2B and tagging @SecretaryAcosta (Department of Labor), @DHSGov (Department of Homeland Security), @USCIS (U.S. Citizenship and Immigration Services) and @WhiteHouse. KEEP encourages Kentuckians to tag @SenMajLdr (McConnell), @RandPaul and @RepAndyBarr, with Lexington Congressman Andy Barr a co-sponsor of H.R. 2004, the Strengthen Employment And Seasonal Opportunities Now (SEASON) Act.